Buy StyleCo L Size Bean Bag Without Beans Worth Rs 799 For Rs 299 Only from Shopclues. This large size modern classic bean bag cover is from the house of StyleCo. Easy to move around, it can be used in any room of your home or office or even outdoor. Match it with your furniture to enhance the look of your furniture. 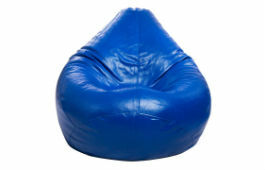 Please note that this is just the bean bag without beans. The beans have to be purchased and filled separately.